I don't typically pick up wines at the grocery store. It is impossible to know how they've been treated along their route, if there is a problem I have little confidence that I could return a corked bottle for a refund, and the selection is completely uninspiring. Yesterday was an exception. I was at the grocery store picking out some fresh fruit and cheese for dinner. I wanted to come home, sit on the back porch, and just unwind with a light meal. Everything I grabbed: peaches, mild cheddar, bread screamed white wine. I don't keep a ready supply of "Wednesday night" whites at the house, so the wine aisle called my name. It is strange that with my affinity for unoaked, Burgundian style chardonnay that I have never had a Louis Jadot Macon-Village wine. Despite the fact that I have seen this wine on the shelves at Jewel hundreds of times before, I have always found an excuse to pass on it. Last night, with the wine on sale, I pulled the trigger. Boy have I been missing out. This wine was exactly what I look for in a cheap white burgundy. It isn't mortgage my house, buy every case on the planet good, but it is a solid performer. Totally devoid of oak, this wine lets the chardonnay grape shine. There are wonderful fruit flavors that match with the peaches (or any other fresh fleshy fruits) I had. The acidity is crisp and lively which is great for a hot summer night, and it washes down a big chewy bite of sourdough like a champ. I'm going to have to watch the sales on this wine, 'cause if I can find a good price I will certainly stock up. If you're looking to try an unoaked chardonnay, or just want a good value wine, I encourage to check this wine out. Tom Wark over at Fermentation has written more on HB 429. If you aren't aware, Illinois House Bill 429 seeks to create regulation of the Illinois liquor industry after a Supreme Court ruling rendered the current Illinois laws unconstitutional. The bill would limit direct shipment sales from in state wineries, and would eliminate wine shipments from out of state retailers. For more info, check out Tom's post on the subject. I've added a calendar feature at the bottom of the sidebar. This is a Google Calendar that you can either view here, or subscribe to in your own Google Calendar or your iGoogle homepage. I will be using this calendar to manage the events I'm planning to attend. I go to a good number of tastings and events throughout the year, so hopefully this will serve as a guide for someone looking for a tasting to go to. Check it out and let me know what you think. So far it looks like September 8th might shape up to be a long day of tasting for me. I made it out to Sam's Wine and Spirits in Highland Park this Saturday. Sam's was pouring wine from 1-4PM, and serving burgers and brats alongside it. There were about 5-6 distributors there pouring wine, as well as probably a dozen more pouring beer, and serving snacks. I tried too many wines to remember what they all were. There was a downright excellent Duero red wine being poured for about $20. In fact I think the wines at the "Spanish Table" were the highlight of the afternoon. The distributor was very knowledgeable of each of his wines, and he was very friendly and entertaining. As an interesting side note, one of the distributors had Dancing Bull Zinfandel open. I begged a taste off of him, and was pleased to find that there were no harsh notes to the sample at all. I suppose I owe an edit to my previous post. I think the most memorable portion of the afternoon was the Italian sausage, cheese and vinegars. I snacked on some cheeses and sausages that were quite good, but the thing that stood out most was a balsamic vinegar. I make it a point to buy what I've always considered good vinegar when I buy it for salad dressings. The vinegar I tried (80 year old) was incredible. At $40 a bottle I wouldn't be putting it on salads, and I don't think it was intended for that purpose. I think it is fair to say that this vinegar was an eye opening experience. The distributor suggested drizzling it on strawberries or ice cream. As crazy as that sounds at hte outset, by the time I'd tasted the stuff, I was convinced he was right on. I'll have to try it sometime soon. Overall the event was wonderful. Some great wines, some good food, and lots of friendly people getting together to share it all. Thanks Sam's. I'm looking forward to some of their upcoming grand tastings this fall. I'll try to keep everyone posted of when those are coming up. I go to a lot of wine events in and around the Chicago area. I use several sources of information to find out what's going on. 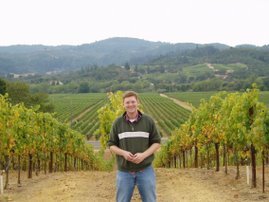 For anyone who is interested in finding out about tastings or seminars, I wanted to provide a list of sources I use for information. samswine.com - Sam's Wine is a huge wine retailer in Chicago. They put on events at their 3 area stores, as well as off site events like Ravinia Bus Rides. binnys.com - Binny's is another retailer with quite a few more stores in the Chicagoland area. Binny's puts on tastings at most of their locations throughout the year. Some tastings are free, and some have an associated cost. eriwine.com - this is one of those, should I share or not kinds of things. ERI is an auction house in Chicago. They regularly have tastings to promote their auctions. I've been to one of these tastings, and I was quite impressed. These are not events for the casual drinker. The entry fee can be as much as $50, and the wines are well worth the price. Typically ERI will open bottles of rare or old vintages to hype up the auction. Many of the big name wines appear in these tastings. The $50 entry is a good deal, as you get an ounce of any of the wines you are pouring. many of the wines could then go at auction for several hundred dollars. Do the math, and you may be getting $100+ worth of wine. The wine goes fast, so get there on time, and don't spend too much time socializing with your friends. Overall I would say that these sites make up the majority of my wine event information. It is rare that I hear about an event that wasn't mentioned in one of these places. If you are looking ot attend more events, I would suggest subscribing to the localwineevents.com newsletter, and checking the other places from time to time. I was grilling out Tuesday night, and on my way out of the grocery store, decided I wanted a simple Zinfandel to go with my summer meal. 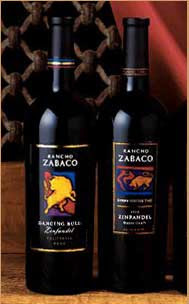 I have fond memories of Rancho Zabaco Dancing Bull. On many a night, my siblings, parents, and myself would linger at the table after dinner over a bottle. Overcome with a sense of nostalgia, I grabbed the bottle off the shelf and took it home. I think it is fair to say that when I opened the bottle, I did not get what I remembered. I've never been under any illusion that an $8 bottle of wine can aspire to any level of greatness. I had no expectation that this bottle would change my life. What I did expect to find inside was an easy drinking, fruity zin. What I got was a harsh chemical component, and even more tannin than the last glass of cab I had. Maybe I got a bad bottle, or maybe it was an off year, but I don't think so. I pondered this for quite a while. I suppose it is possible that my memory of those days has faded, and that the wine was always as bad as it is now. I considered the idea that much like the memory of a loved one who has passed on, I forgot the bad, and elevated the good memories. I suppose that is possible, but what I suspect is that my tastes have evolved. I recognize imperfections more readily, and I can "taste" the wine better than I could before. Most of the time I am happy about that. It is wonderful to be able to stick my nose into a great glass of wine, and appreciate the nuances of what is in front of me. There are days though, when I wish I could shut off that honed sense of palate and just enjoy what is in front of me. Edit: on Saturday I tried a sample of Dancing Bull at a tasting, and I detected none of the harsh notes I mentioned above. I've always believed that the best part of wine is the connection it creates between the people who drink it. There are people who can tell you everything about a great wine they had at a party or dinner. For those people the wine is the highlight. But I'm more likely to tell you who was with me the night I had a great bottle of wine. For me the people and the night is the highlight, and the bottle just serves as the silver lining. It would be great to appreciate this wine as much as the memory it represents. Maybe there is an added step in cultivating a mature palate. The ability to turn it off.